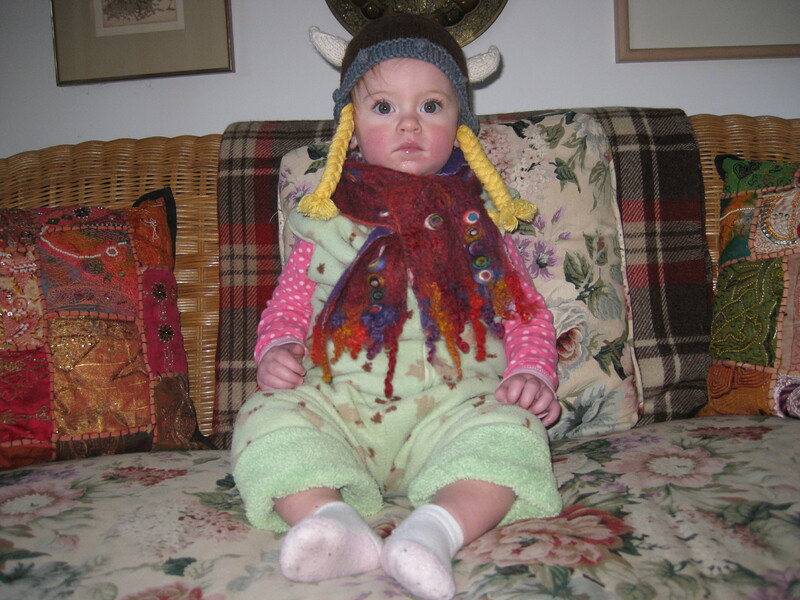 A hat to wear while toddling. 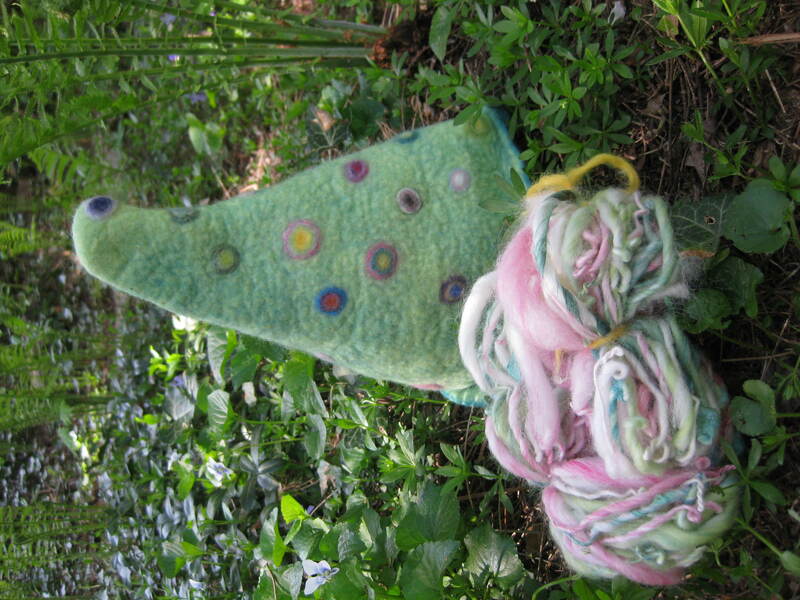 I’ll lightly felt the skein of my hand-spun yarn to set the twist, and then use the yarn to embellish the hat. 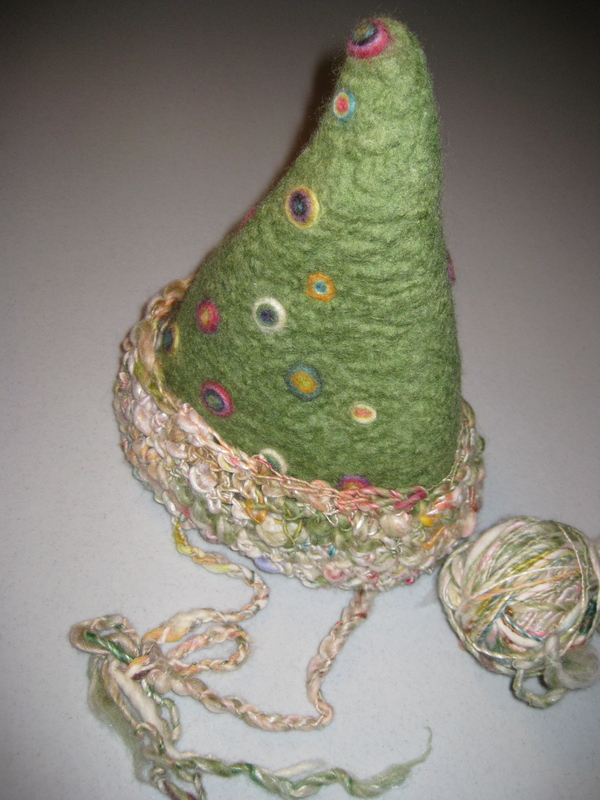 I might add some embroidery — this little hat asks for some pink stitching and some tiny beads. It always feels good to straighten up the studio and get new work completed and labeled to share with others… I’ve been working on these Rhapsody Rose scarves and some corsage pins today. 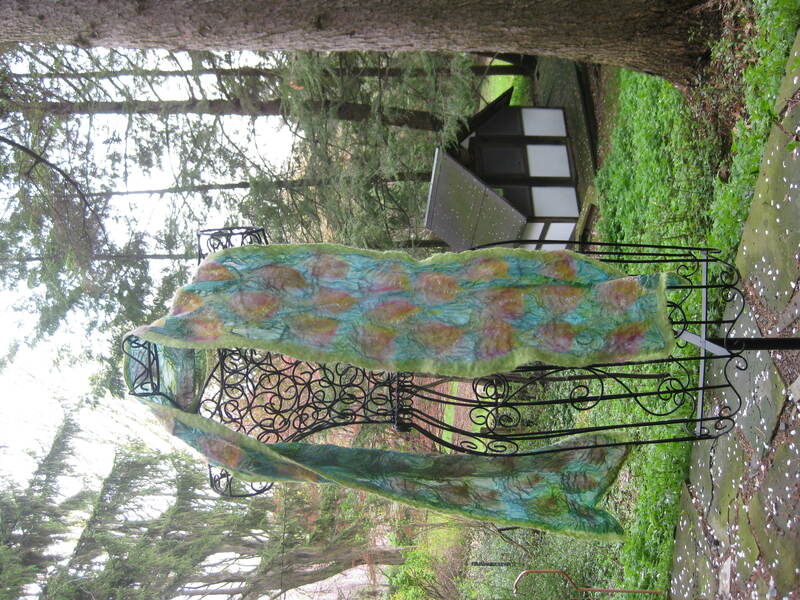 The silk fabric base for this nuno scarf is the work of fiber artist Suzanne Morgan. 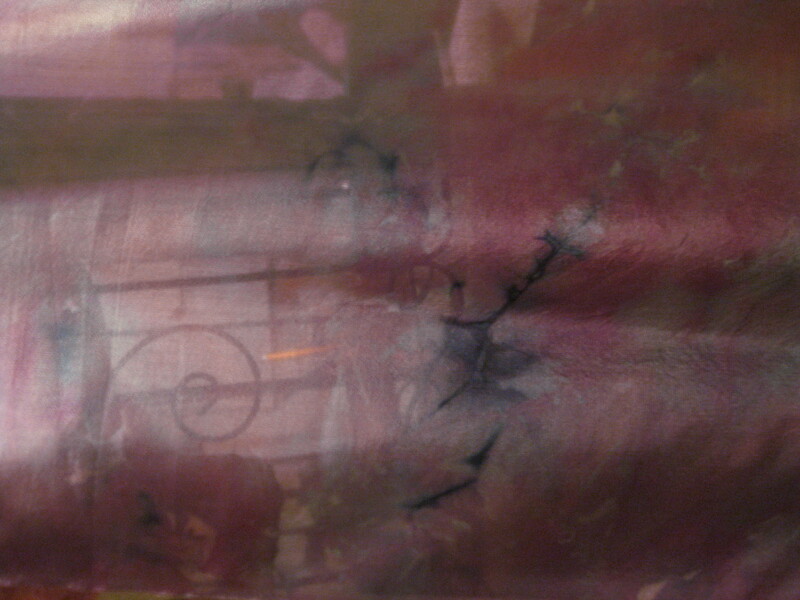 Her hand-dyed silk fabrics are as interesting — with subtle variations on every inch of the yardage — as they are exquisite. I feel grateful for her beautiful silks, and for her inspiration. 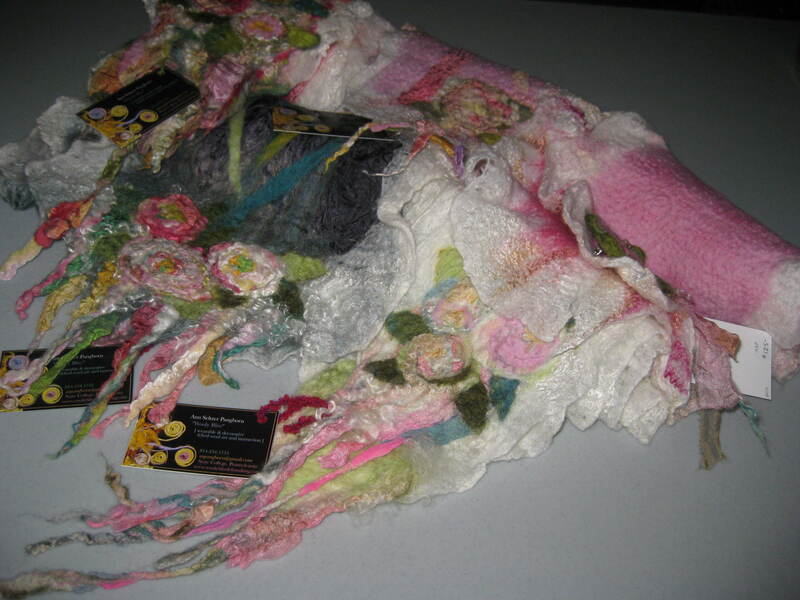 One image now of the completed scarf, more later! It was a long, cold winter in central Pennsylvania. Somehow, we managed to keep warm and happy…! 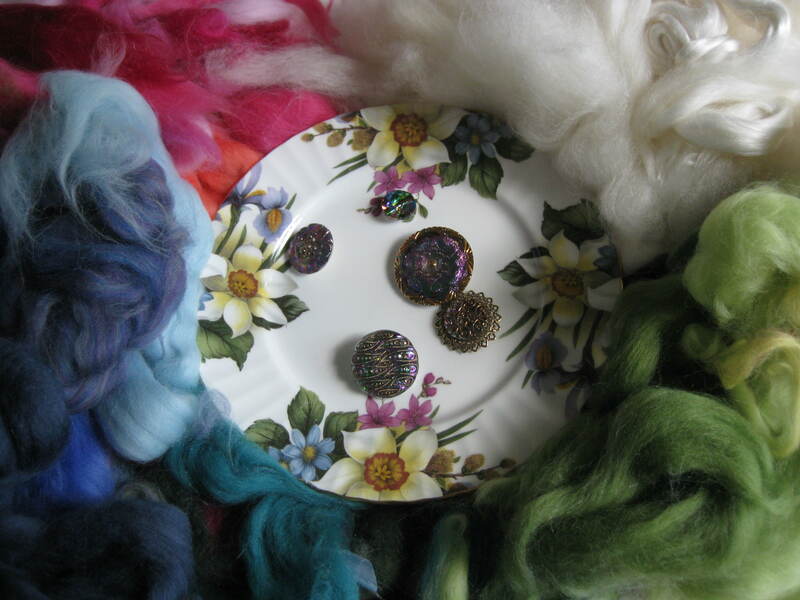 right is a fusion of my felt and hand-spun yarn. 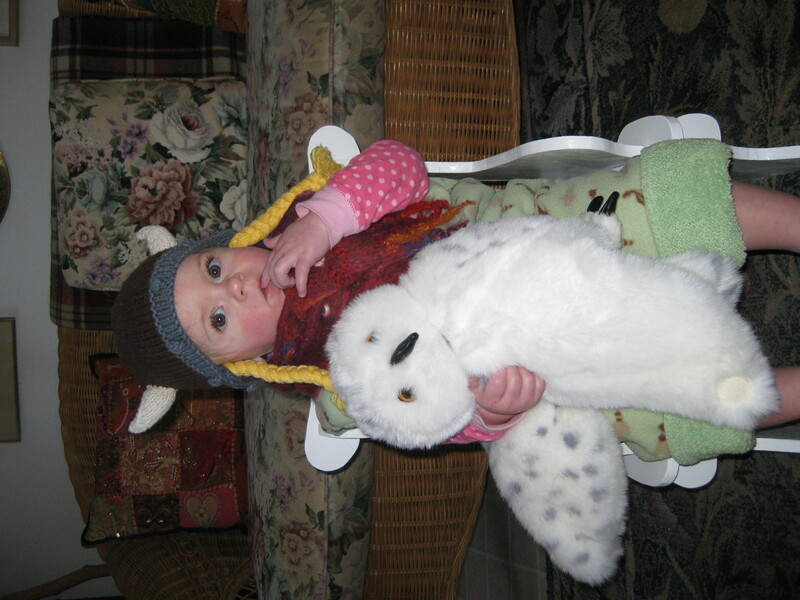 One of the best things about feltmaking is being able to nurture those you love with your handiwork! 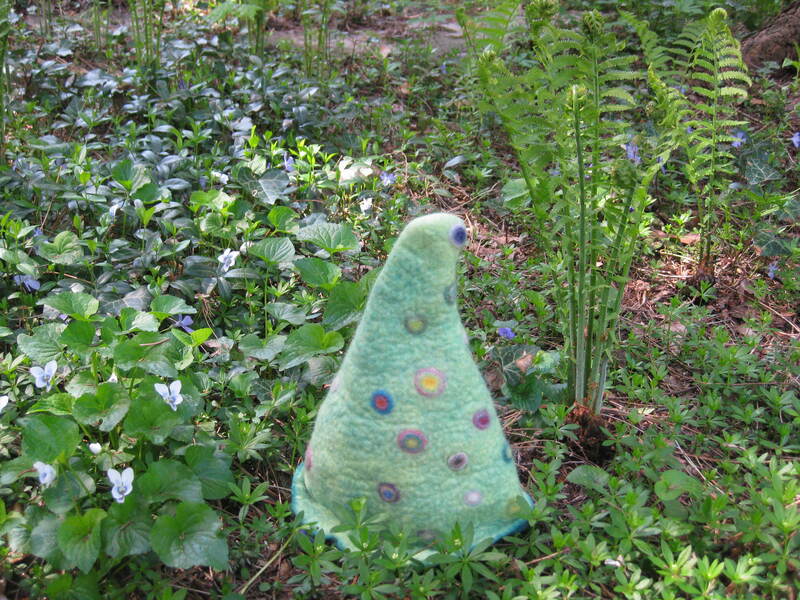 Students learning feltmaking often ask “How will I know the piece is done?” Good question. 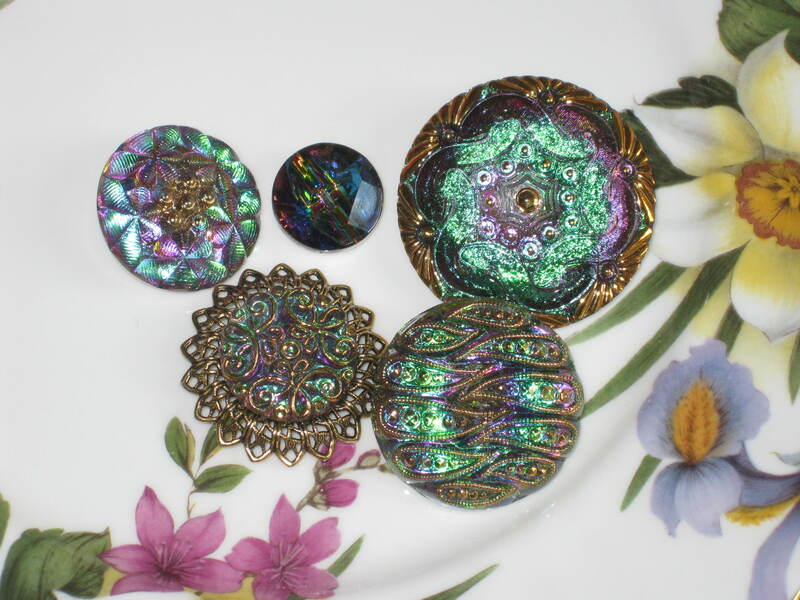 My advice is that since you can always work a piece MORE, but you cannot UNDO fulling (shrinking) once a piece has been overworked, the time to stop is before you think it’s completely done. 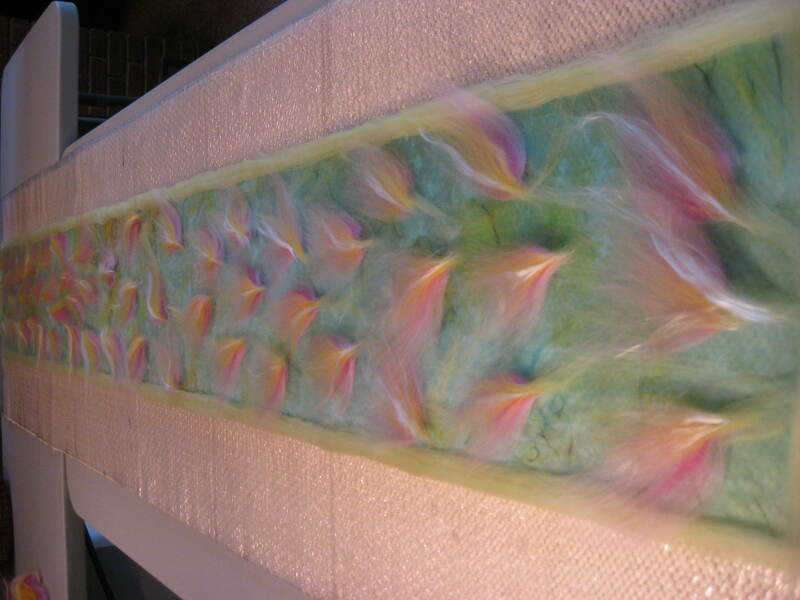 An experienced felter can feel this change in the fibers; those newer to felting need to pay careful attention in the fulling process. 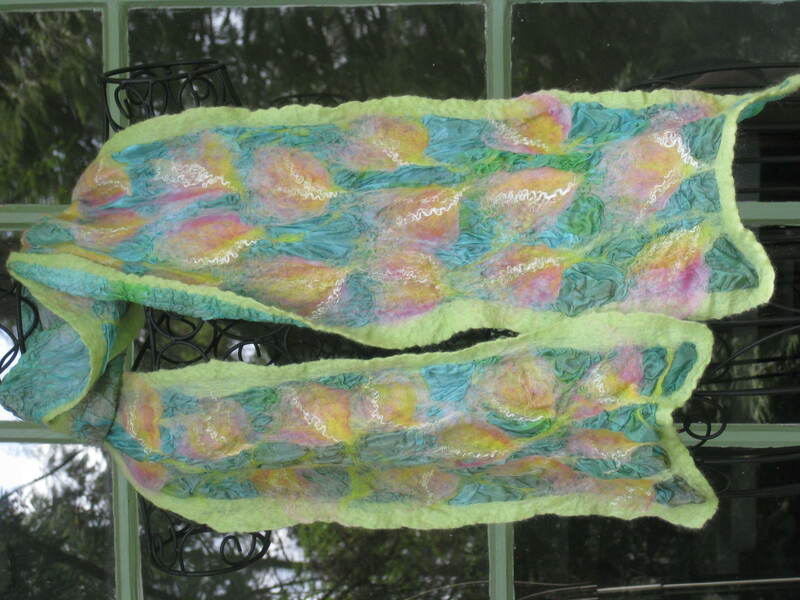 I thought of this question as I worked on this Mimosa Scarf. 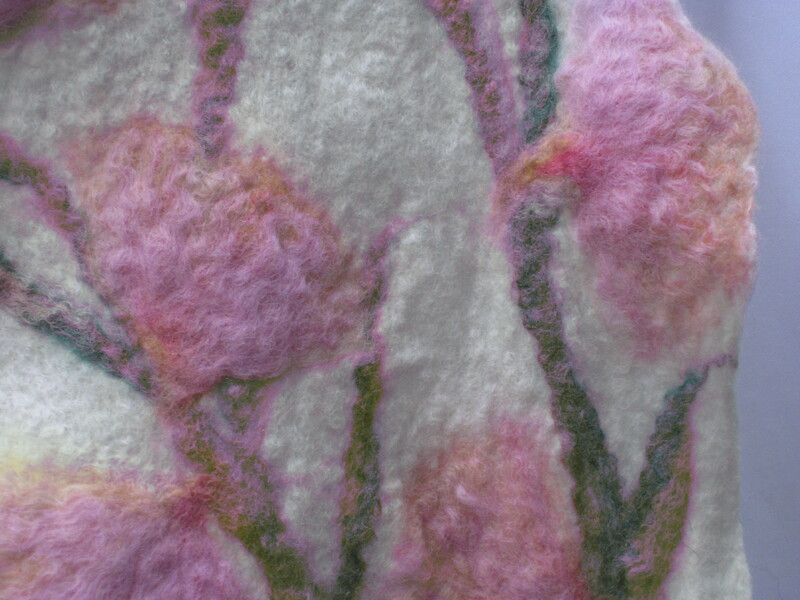 Each mimosa flower is a little assemblage of nine wispy layers of different merino and silk fibers, and this layering results in a slightly textured surface that highlights each flower. 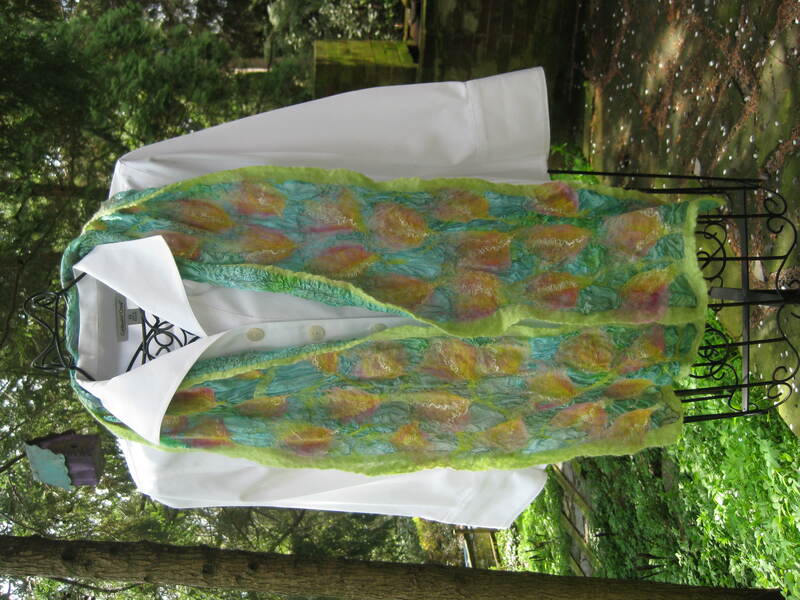 The chartreuse merino on the bottom layer hints through two layers of white merino/white silk fibers. I wasn’t sure how these layered flowers would look where I deliberately overlapped them along the edges to create a random border. As I worked the piece, I noted that by paying attention to how the edges were changing I knew when to stop — in this case, when the edges still had a bit of that deckled “cobweb” look. By stopping before the edges seemed done I could continue to full the piece: while rinsing out the soap, while giving it a vinegar rinse to remove any remaining soap, and then while rinsing the vinegar. I continually checked all along the edges of the piece to make sure those flowers did not curl under or over. 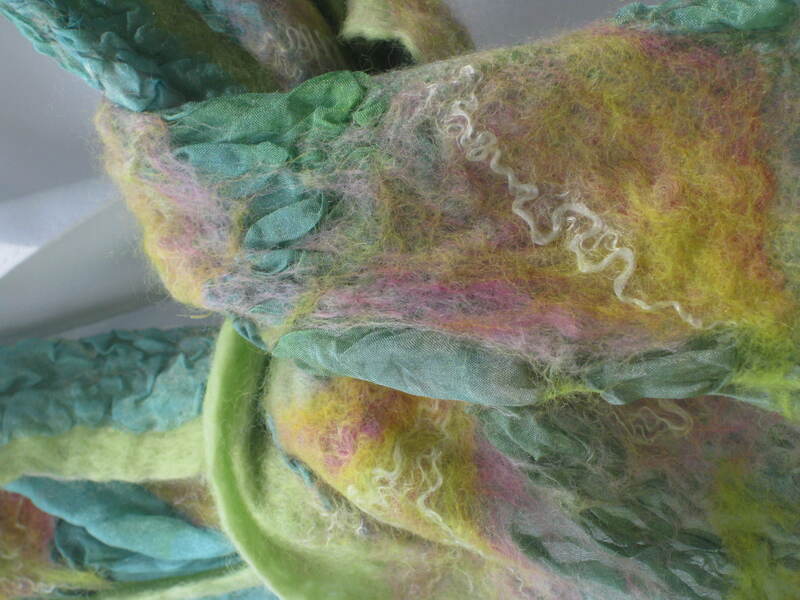 I describe my feltmaking process as “sculptural” to explain the layering of fibers and placement of design elements. 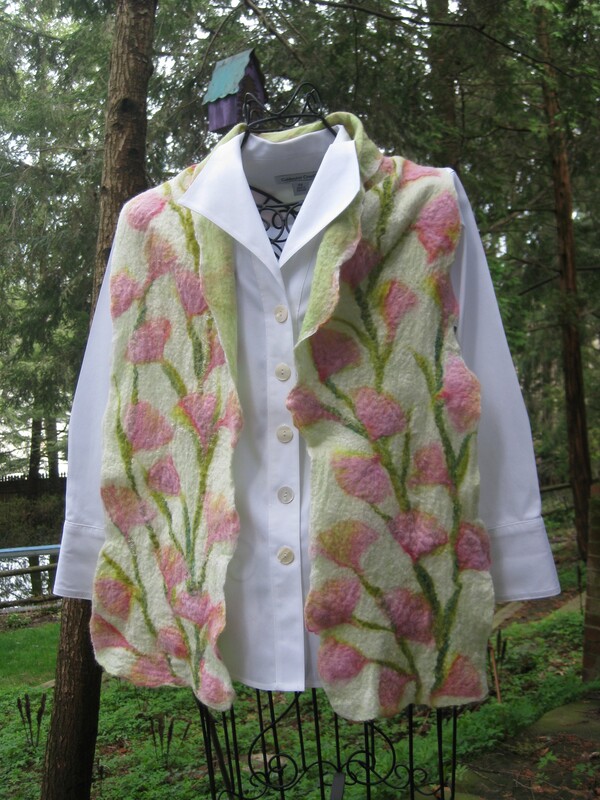 In this Mimosa scarf, I tried to create the randomness and lightness of mimosa flowers. The bottom layer is a soft chartreuse green merino; the mid-layer and top layer are a white merino/silk fiber blend; the stems of the mimosa are my handspun, merino and silk. 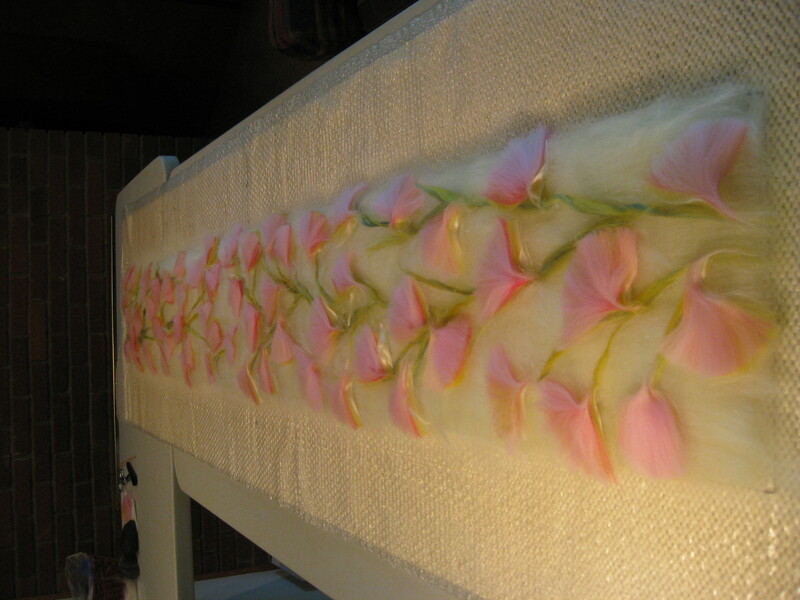 I used a lot of white tussah silk in the flower layers, and hope this adds shimmer and texture to the finished scarf. After being wet and worked, the design will lose much of the visual fluffiness and texture of the dry lay-out. I’m hoping that by overlapping the edges here and there to create softly undulating borders; and with the use of so much silk — three different kinds of silk all over the piece — the piece will offer so much softness and such a light drape that it will feel and look like mimosa.